CANYONS MEET in Noctis Labyrinthus, a checkerboard region where the Martian crust stretched and fractured. As cracks and faults opened, ice and water in the subsurface escaped, making the ground collapse. 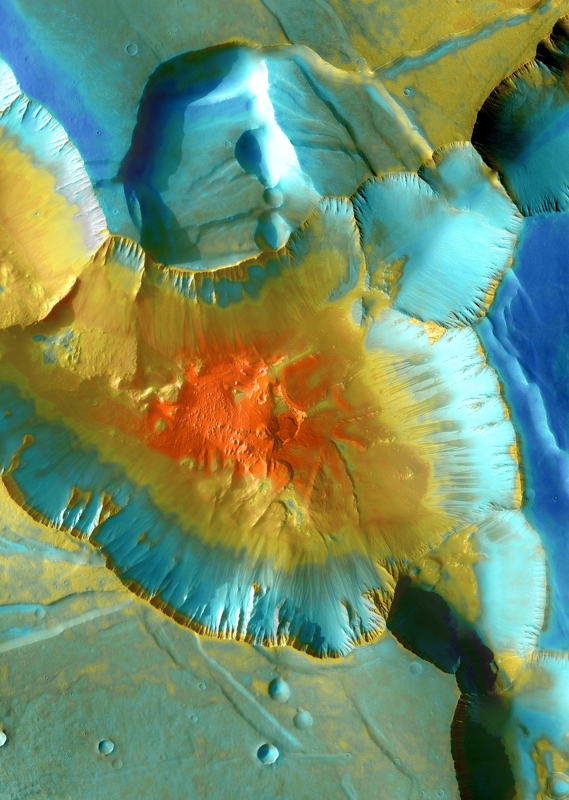 This false-color mosaic focuses on one canyon junction 4 kilometers (13,000 feet) deep. Dust (blue tints) lies on the upper surfaces, while rockier material (warmer colors) shows below. This image, 30 kilometers (18 miles) wide, was made using THEMIS frames taken at visible and infrared wavelengths. 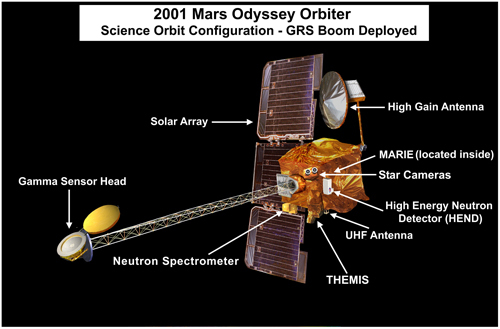 The Thermal Emission Imaging System (THEMIS) gives scientists a global view of Mars at both visible and infrared wavelengths. Carried aboard NASA's Mars Odyssey spacecraft, THEMIS circles Mars once every 2 hours in a nearly polar orbit; essentially, the entire Red Planet passes under its view. THEMIS is a multi-band camera that works at 5 visible wavelengths and 10 infrared ones. The visible images see details on the surface as small as 18 meters (59 feet) wide; infrared images can detect features 100 meters (330 feet) across. 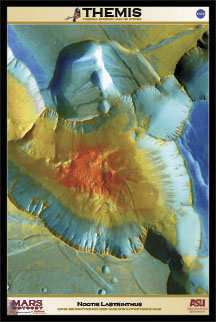 The global coverage lets scientists investigate questions regarding volcanoes, craters, sand dunes, atmospheric dust, and changes in the polar caps, to name just a few. In addition, the multi-band imaging, which combines two or more views taken at different wavelengths, can let scientists study the nature of the Martian surface materials all across the planet.